Combination monitor mount and laptop holder. 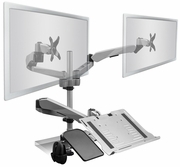 Full-motion arms are height adjustable. It can be used as a sit-stand workstation. The monitor holders have standard VESA 75 and 100 bolt hole pattern. It is compatible with Samsung, Dell, HP, ViewSonic, Acer, Asus, eMachines and other 13 to 27 inch monitors. Elevating the monitors and laptop provides more space on your desk and allows an ergonomic installation. Ergonomic seating position prevents neck and back issues related to incorrect posture while sitting. The laptop tray has vent slots to allow the computer to cool. the tray can tilt up to 90 degrees. Separate mouse pad and mouse holder provide additional functionality.